Reiné’s film deals with a turbulent period in the history of the Netherlands during which battles were fought on two fronts: from the exterior threat of the English, French, Germans and Spanish, who mistrusted Dutch republicanism and envied their trade; and an internal conflict which pitted republicans and monarchists – the Oranjes – against one another. The fate of the country comes to rest on the shoulders of one man: Michiel de Ruyter, one of the country’s most decorated naval heroes, famed for his tactical prowess on the high seas. The vastly experienced De Ruyter (portrayed by grizzly Dutch actor Frank Lammers) bemoans the 15 years he has spent at sea, to the neglect of his family. A portly, shaggy-haired St. Bernard of a man, De Ruyter steps into the shoes of reluctant and unassuming saviour of a nation. “You’re our only hope, Michiel.” says liberal, forward-thinking prime minister and confidant to De Ruyter, Johan de Witt (Barry Atsma). No pressure, then. Given the scope and ambition of the picture, the reported 8 million euro budget is used economically and put to good use: sweeping, panoramic shots of vast fleets of ships and slow-mo actions sequences with splintered wood, canon balls and smoke a-plenty are impressively put together when you consider the $150m budget of a film like Master and Commander (Peter Weir – 2003). A series of explosive set pieces and a daring night-time raid on the English fleet at Chatham punctuate the political discussion and family respite well. The bloated theatrical running time of 153 minutes has been streamlined to just shy of 2 hours for the DVD release but I can’t help but feel that the material at Reiné’s disposal would have been better suited to a mini-series. Admiral’s subject matter will not be overly familiar to viewers outside the Netherlands and a deepening of the historical context and further fleshing out of the individuals involved would have benefited the project as a whole by allowing for greater emotional and intellectual investment on our part. 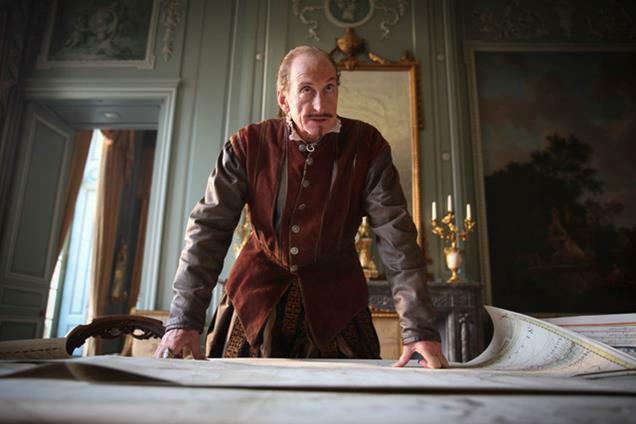 Charles Dance effortlessly summons Game of Thrones experience in playing a Charles II fond of a concubine or two but his turn leaves no lasting impression. A swashbuckling period piece with subtitles, Admiral is not always plain sailing but is admirable high-seas adventure drama that will introduce you to an important Dutch man. It is now available On Demand and on DVD in the UK.